Tina Fey stars in Good Morning, Afghanistan! For as beloved as she is for her work in television comedy, Tina Fey has not shown great judgment in choosing movie projects. With the exception of Mean Girls -- a film she wrote -- her big-screen efforts have alternated between tolerable and lazy. Despite a few movies that have seemed like slam dunks on paper (Date Night, Sisters), Fey has yet to receive the right vehicle to make use of all of her talents and turn her into a proper movie star. Her latest, Whiskey Tango Foxtrot, probably comes closest. This is not by mistake. In addition to developing the film, Fey produced it alongside her husband Jeff Richmond and mentor Lorne Michaels. It is scripted by Robert Carlock, her producing and writing partner on 30 Rock and Unbreakable Kimmy Schmidt. This is a movie not just starring Tina Fey but packaged by the Tina Fey Machine. It is engineered to bring out the best in her. At this, it mostly succeeds. She's good in the movie. And the movie itself? It's...good enough. Based on journalist Kim Barker's memoir The Taliban Shuffle: Strange Days in Afghanistan and Pakistan, the movie casts Fey as Kim Baker (it's one letter different! ), a news copy writer working a desk who is sent to cover the war in Afghanistan in the mid-2000s. She befriends fellow reporter Tanya Vanderpoel (Margot Robbie) and freelance photographer Ian MacKelpie (Martin Freeman), all of whom are navigating the dangers of covering a war that's being forgotten by the rest of the world while trying to find stories that the networks will actually air, which means putting themselves more and more into harm's way. The longer Kim is there, the more normal the danger feels. 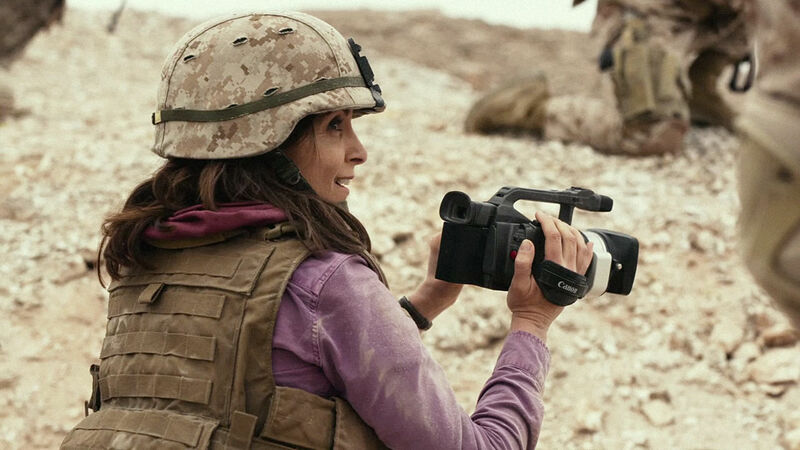 Whiskey Tango Foxtrot is a lot like a '90s Touchstone movie: an inoffensively bland and commercial mid-budget comedy drama made for adults built around a single star. It would feel dated if it wasn't for the 2016 sheen given to it by directors John Requa and Glenn Ficarra (the team responsible for I Love You Phillip Morris, Crazy Stupid Love and Focus), who add a bunch of indie band mopery from the likes of Elliot Smith (RIP), The National and Radiohead and every once in a while assert themselves with a show-offy camera move, like an extreme closeup of Tina Fey's eye looking out from behind her niqab that looks like something right out of Opera. Such moments are few and far between, though, as the movie is most often more than happy to be competent. And competent it is, with the exception of a screenplay that relies too heavily on cliches and movie shorthand. It gets tricky here, as I have not yet read Barker's book. It's entirely possible that all of these things really happened to her, in which case her the events of her life played out a lot like a Hollywood movie. The alternative is that her story was compressed, shifted and otherwise invented by screenwriter Carlock, which would explain why it feels a lot like yet another movie in which the "mysterious" Middle East is experienced through the eyes of a white character. There are moments of insight and specificity -- like I said, it's the kind of stuff that makes the movie just good enough -- but then there are heavy-handed visual symbols and a beautiful blonde woman who's really an opportunist and a boyfriend who cheats long distance and a third act crisis that feels manufactured to be a third act crisis, even if it's exactly what happened in real life. The fact that it's based on someone's actual experiences should suggest that we lose ourselves in the carefully observed detail, but the movie never lets you forget that you're watching a movie. 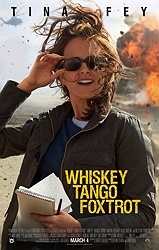 Whiskey Tango Foxtrot is the kind of movie that's hard to review. It's fine. It's put together well, the performances all work and every once in a while it offers a scene or a moment that's good enough to justify its running time. It's a good vehicle for Tina Fey, but hardly the kind of movie that anyone will be talking about six months from now. It is destined for success at Redbox -- something that might be worth seeing, but not quite worth seeking out. WTF indeed.